The waitress was right, service animals are not allowed anywhere where food is prepared or served. 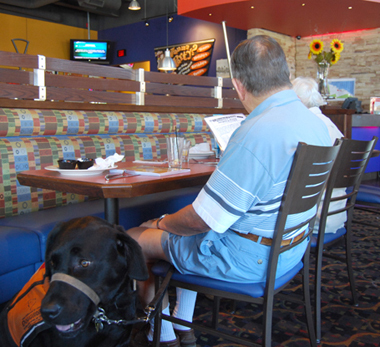 The waitress must let Justin keep his guide dog with him in the restaurant. Although another law prevents animals from going where food is prepared, it makes an exception for service dogs in areas where food is served or sold. The waitress was just following her restaurant's policy that dogs are not permitted — it doesn't matter what the law says. Speak directly to your customer and don't treat the animal as a pet. Avoid touching or talking to service animals — they're working and have to stay focused. Avoid making assumptions about the animal. Not all service animals wear special collars or harnesses. If you're not sure whether the animal is a pet or a service animal, just ask your customer. You can ask for a letter verifying that it is a service animal. Normally, you can tell.